Abortion Wars on the Streets of SF! 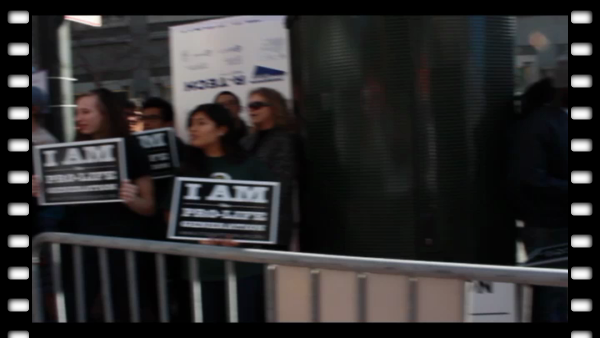 Pro-choicer's confront and protest the presence of the pro-lifers on the streets of San Francisco. The war over abortion once again hits the streets of San Francisco. Ever since 2005 the religious community has been holding an annual gathering called the Walk for Life. Their message has been the same for the last 10 years. Pro-lifers believe ““Women Deserve Better than Abortion”. Additionally they also believed holding those events in liberal San Francisco packed a bigger punch because people in San Francisco are more apt to “open to new behavior or opinions and willing to discard traditional values.” Meaning San Franciscans believe that NO laws nor religion should govern decisions about their bodies and their health and their welfare. But the pro-lifers come in buses from all over California, and other parts of the West to push their message, which is “Abortions should be banned by law. Women seek abortions for their own reasons, and some are so desperate or unhealthy they will do what they will have to, to abort. Before abortion was legal some of the processes they used "back-alley", "backstreet", or "back-yard" abortion were dangerous and sometimes deadly for both fetus and mother. Unsafe abortions are believed to have caused “approximately 69,000 deaths and millions of injuries annually.” Which is why San Franciscans confront, scream-down, and protest their event. Only a small group of SF’ers, compared to the pro-lifers, get out and protest them, but they still do it every year. Pics and video from the demonstration. It also seemed that SFPD was pushing around journalists. Both side have signs up here. The pro-lifers and the pro-choicers. §Both sides constantly had the police running.